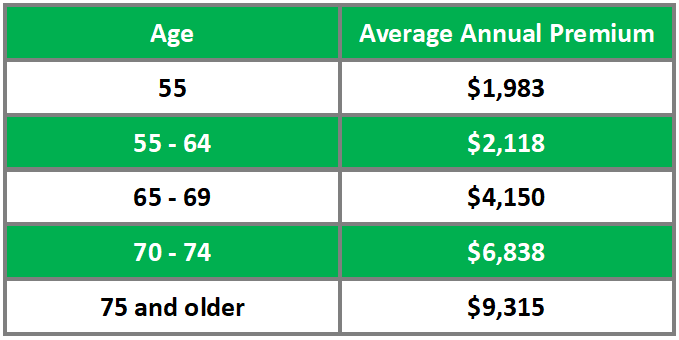 Premiums for long-term care insurance are based on the insured’s age at the time of issue. As a general rule, the younger the insured is at the time of application, the lower the policy’s premium. In addition, LTCI premium rates are set so that the same rate applies over long periods. This is in keeping with the concept that LTCI is designed to be maintained for the long term. It is not priced or subject to renewal annually. The policy cannot be canceled or non-renewed because of the insured’s age or health. Premiums cannot be increased, except on a class basis. Consequently, while it is true that individuals cannot be singled out for an increase because of their age or health, insurers can increase premiums for entire classes of insureds, such as all policyholders age 75 and older, based on the company’s claims experience. Of course, insurers must justify premium increases to state insurance departments, but states have limited authority to deny those increases, especially when claims experience supports requests for rate increases.